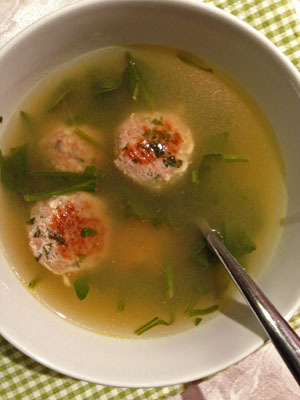 Yummy turkey meatballs, not in a traditional tomato sauce, but in a chicken soup. How about that for a nice change? With the cooler weather and rainy days, soup is always a great comfort meal. But sometimes I just get bored and like to change things up a bit, why not? Turkey meat has a great flavor just by itself but I wanted to kick it up a notch so I added some Pecorino Romano and Parmigiano Reggiano cheese into the mixture. It really makes a difference, especially if you are a cheese lover like me. But then, who doesn’t love cheese? So instead of making a tomato sauce I opted for a nice, hot bowl of turkey meatball with spinach soup. So simple to prepare and all under 60 minutes. For some added nutritional value I added fresh organic spinach that provides vitamin K and iron. Simmer this in some chicken broth and you have a delicious and nutritious meal! Turkey contains vitamins B-6 and B-12, niacin, choline, selenium and zinc and lean, high protein. The dark meat of turkey tends to contain more vitamins and minerals, but also has more fat and calories. I chose an organic, 93% lean ground turkey. But if you cannot find organic ground turkey, opt for the leanest cut you can find. Spinach is a super food. If you recall Popeye the Sailor Man, he ate spinach for strong muscles. Well, the iron in spinach is very high and great for promoting red blood cells while the vitamin K plays a key role in helping the blood clot, preventing excessive bleeding. Recent research has shown that having adequate vitamin K is important in preventing heart disease, osteoporosis, diabetes, multiple types of cancer, and even Alzheimer’s disease, among others. Not bad for such a simple soup, right? So do as your mom said, and eat your spinach, but as always, Enjoy! Previous Post Happy Halloween Apple Marshmallow Treats !!! !